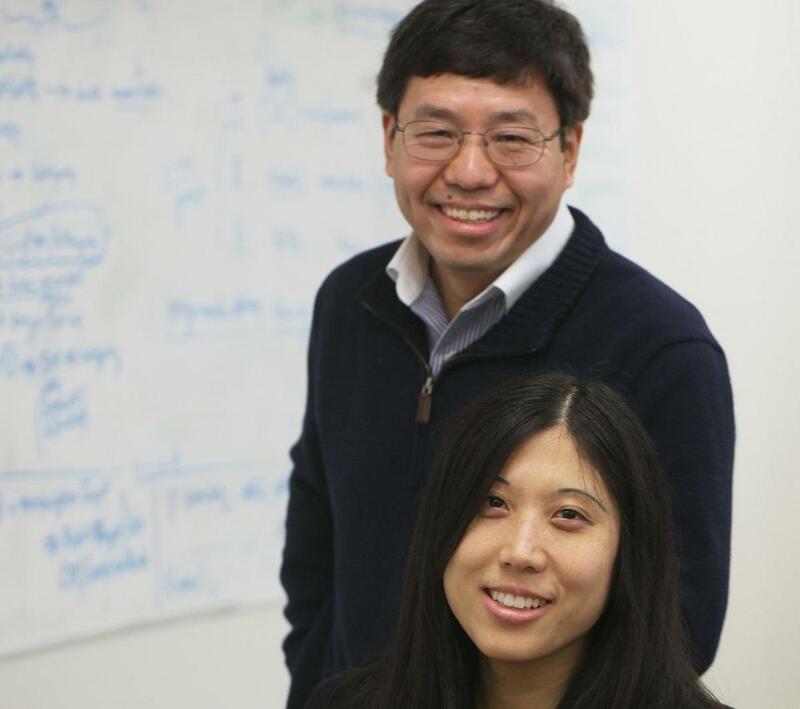 Quattro alumni Jennifer Lum and Changfeng Wang founded a new company, Adelphic Mobile. Just before Christmas in 2009, Andy Miller gathered the employees of his Waltham mobile advertising start-up in an open bullpen area. The employees figured it was probably the year-end review of the company’s numbers. But then Miller showed a video of Steve Jobs introducing the original iPhone. He talked about how much he admired Jobs and Apple’s obsession with building great products. Then, he told the assembled troops that he was selling the three-year-old company, Quattro Wireless, to Apple Inc. The price: $275 million. Today, there are no Quattro or Apple employees in Waltham. What has transpired in the two years since the acquisition is a case study of what happens when out-of-state companies buy Massachusetts firms, but decide not to establish a presence here. There are positive and not-so-positive elements. Quattro built a system to deliver ads to mobile phones, often including “rich media’’ like video or animation, and hired a sales force to pitch brands like Ford and Disney on the merits of reaching consumers as they played a game or surfed a news website on their phones. When the acquisition closed, Apple sent all of Quattro’s employees a new MacBook and iPod Touch. But not everyone was offered a job. “Some folks didn’t fit into the new order,’’ Miller says, and they got severance packages. People who wanted to keep their jobs - except for sales reps in cities like New York and Los Angeles - had to commit to moving to Cupertino, Calif., where Apple is headquartered. “Ninety-five percent of people who got offers took them,’’ Miller says. And they have done very well with stock they received as part of the acquisition, as Apple’s share price has risen to nearly $600 from $215. When the company was integrated into Apple, it began to focus on advertising that would appear in downloadable apps, as opposed to mobile websites. By April 2010, the Quattro team had turned their product into Apple’s iAd platform, and Miller was barnstorming around the country signing $10 million and $15 million contracts with advertisers like Nissan and AT&T. Miller stayed at Apple for almost two years. “It is a great place, but also very stressful,’’ he says, referencing his once-a-week meetings with Jobs, who died last year. Last summer, Miller left Apple to join Highland Capital Partners, the Cambridge firm that backed Quattro. But his family wanted to stay in California, so he invests in Silicon Valley companies from Highland’s office there. A handful of Quattro veterans stayed in Boston, and they are involved with two new mobile advertising start-ups. Adelphic Mobile, based in Lexington, announced last week that it had raised $2 million for a system aimed at delivering targeted ads to mobile devices by understanding what device a user owns, where they are located, and what kind of content they have been viewing, for instance. The two founders, Jennifer Lum and Changfeng Wang, worked at Quattro, as did chief financial officer Joe Grabmeier. Lars Albright, another Quattro founder, spent about 18 months with Apple, commuting between Boston and Cupertino, before splintering off to start his own business. The company, SessionM, is based in Boston, and has grown to about 25 employees (including three other Quattro alumni). SessionM is working on a way to “gamify’’ advertising messages, giving consumers virtual or real-world rewards in exchange for hitting certain milestones while using an app - for instance, 25 percent off a pair of Reeboks after using an app to track 100 workouts. Albright and Lum have also started to make small angel investments in early stage tech companies in Boston, using some of their Quattro windfall. The two venture capital firms that backed Quattro, Highland and Globespan Capital Partners, earned between 400 percent and 800 percent on their original investments in a pretty short time period, allowing them to invest in future generations of start-ups. One important role that Massachusetts plays in the 21st-century economy is as the R&D lab to the world, developing breakthrough products that fill innovation gaps at bigger companies. But I worry about the state’s future as a magnet for talent when I think about how few “pillar companies’’ we produce. Those are companies like Apple, EMC Corp., or Fidelity Investments that lead the parade in their respective industries, create thousands of jobs over time, and attract people from other parts of the world to take well-paid, high-powered positions. Right now, Massachusetts’ recycling program is working fine: starting innovative companies like Quattro, selling them, and then starting a new generation of companies. It’s cultivating great companies over time where we need to do better. Scott Kirsner an be reached at kirsner@pobox.com. Follow him on Twitter @ScottKirsner.